Kosin University Gospel Hospital, Busan, Republic of Korea. Background: Lungs and heart are the major dose-limiting organ during radiotherapy (RT) for lung cancer. This study compared Intensity-Modulated Radiotherapy (IMRT) with Volumetric Modulated Arc Therapy (VMAT) in reducing the dose to the lungs and heart. Methods: Ten patients with localized non-small-cell lung cancer underwent computed tomography (CT). The planning target volume (PTV) was defined and the organs at risk were outlined. Five-field coplanar IMRT plans and VMAT plans were generated for each patient. The planning objectives were to minimize the lung dose and heart dose while maintaining the dose to the PTV. Results: All IMRT plans, except for the three-field coplanar plans, improved the PTV90/V20 ratio significantly compared with the optimized 3D-CRT plan. Nine coplanar IMRT beams were significantly better than five or seven coplanar IMRT beams, with an improved PTV90/V20 ratio. Conclusions: The results of our study have shown that VMAT can reduce the dose to the heart compared with IMRT. Lung cancer is the most common cause of cancer death worldwide. Almost 90% of lung cancers are non-small cell (NSCLC), and surgery is the main curative treatment . Many patients are, however, inoperable at presentation . For these patients, radiation therapy of curative intent may be considered, possibly in concurrent with chemotherapy. Since the 1970s, the doses of conventional radiation therapy in NSCLC has been defined as 60 to 70 Gy in 1.8- to 2.0-Gy fractions [3-5]. Intensity-modulated radiation therapy (IMRT) and volumetric modulated arc therapy (VMAT) are widely used for the treatment of advanced stage nonsmall cell lung cancer (NSCLC) and small cell lung cancer (SCLC) because of the superior target dose conformality compared to three-dimensional conformal radiotherapy [6-8]. Radiation pneumonitis (RP) is a common consequence of lung exposure in patients with NSCLC, typically occurring within the first year after treatment. It is reported to affect 11-37% of patients depending on the specific treatment [9,10]. Because RP can be lethal, lung injury can contribute to early deaths in patients received radiotherapy for NSCLC. The studies of factors influencing OS showed that the proportion of heart volume had a significant negative effect on survival . 0In this study, we evaluated whether differences in planned dose distributions between IMRT and VMAT affected treatment related toxicity in lung cancer patients. In this study, computed tomography (CT) datasets of 10 patients treated for lung cancer were used. The patients met the following criteria: Pathologically confirmed primary NSCLC with clinical stage IIIA or IIIB disease, good performance status (Eastern Cooperative Oncology Group [ECOG] score 0-1), radiation dose of more than 60 Gy, no treatment interruptions lasting more than 7 days. The patients underwent (chemo-) radiotherapy with IMRT or VMAT (≥ 60 Gy) for lung cancer. Diagnostic work-up comprised of chest CT and abdomen CT, 18F-fluorodeoxyglucose positron emission tomography (FDG-PET), magnetic resonance imaging of the brain and histopathological confirmation of malignancy. For radiation treatment planning, an intravenous contrast-enhanced computed tomography (CT) scan of the thorax was acquired. The CT data were imported to the planning system. The gross tumor volume (GTV) was defined as the primary tumor and suspicious lymph nodes (confirmed by histopathology after endobronchial ultrasonography, enlarged or with malignant features on CT scan, and/or FDG-PET positive). Clinical target volumes (CTV) enclosed the GTV of the primary tumor and lymph nodes with 5 mm margins, respectively. Planning target volumes (PTV) were created by an isotropic 5 mm expansion of the CTVs. These target volume concepts were equal for both plans. The spinal cord, lungs (as a paired organ), esophagus, heart were outlined as critical organs. The lung volume was outlined to exclude the gross tumor volume (GTV). To generate accurate dose–volume histogram (DVH) data, the both lungs and the heart were contoured by one radiation oncologist. The median doses of prescribed dose to the PTV was 66 Gy in 33 (once-daily) fractions using IMRT and VMAT. Five field IMRT plans using 6-MV photon and dual arc VMAT plans were generated using the Eclipse treatment planning system for each patient. For the purposes of inverse planning, a series of clinical constraints for optimization were specified to the plans. The clinical objective was to minimize the volume of both lungs irradiated to 20 Gy (V20 ≤ 35%), mean lung dose (MLD ≤ 20 Gy). The maximum dose administered of the spinal cord was 45 Gy. The dose prescription was to deliver 66 Gy or 70 Gy to the isocenter in 33 or 35 fractions using 6 MV photons, given on a oncedaily basis within 7 weeks. All constraints of IMRT plan were used for the optimization of VMAT plan and the same total dose was prescribed in each patient. Concurrent chemoradiation therapy (CCRT) was delivered to patients in good clinical condition; all others underwent sequential treatment or radiotherapy alone (Table 1). All medical records were retrospectively reviewed. Patients and tumor characteristics were collected. To quantitatively measure the organ at risk (OAR) sparing of each plan, the following parameters were extracted from the treatment planning system: Mean lung dose (MLD), mean heart dose (MHD), LV10Gy to LV50Gy (percentage of lung receiving ≥ 10 Gy to ≥ 50 Gy) and HV10Gy to HV50Gy (percentage of heart receiving ≥ 10 Gy to ≥ 50 Gy) in 10 Gy increments. Differences between the IMRT and VMAT groups were evaluated statistically. Statistical analysis was performed using the paired t-test. A p value <0.05 was defined as statistically significant. A total of 10 patients were included in this analysis. IMRT plans and VMAT plans were generated for each patient. Patient characteristics are provided in Table 1. Median total doses to the PTV were 66 Gy (range 66-70) respectively. The Differences between dose-volume histogram parameters for IMRT plans and VMAT plans of 10 patients were compared as shown in Figures 1 and 2. The LV10Gy was statistically significantly lower (4.15% vs. 45.5%; p=0.03) in IMRT plans than VMAT plans (Table 2). All other variables in lungs did not differ between groups. Mean lung dose of IMRT Plans was 16.2 Gy (range, 12.8 to 18.2 Gy) and this was not significantly lower than that of VMAT plans which was 17.3 Gy (range, 14.1 to 19.9 Gy; p=0.23), and mean lung dose difference between the two plans was 1.1 Gy. The result of HV10Gy< and HV50Gy showed no statistically significant difference. However, the HV20Gy, HV30Gy and HV40Gy were statistically significantly lower (21.4% vs. 25.8%; p=0.02, 13.1% vs. 16.3%; p=0.01, 7.3% vs. 11.5%; p=0.004) in VMAT plans than IMRT plans (Table 2). 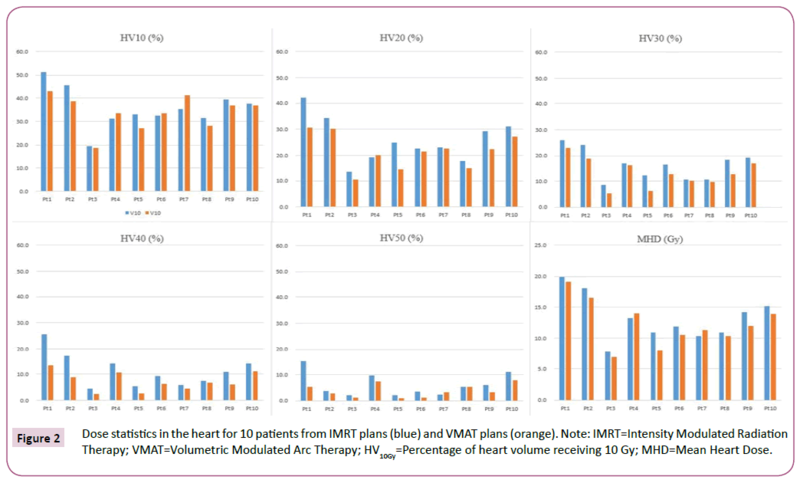 Mean heart dose of VMAT plans was 12.2 Gy (range, 6.9 to 19.2 Gy) and this was significantly lower than that of IMRT plans which was 13.8 Gy (range, 7.7 to 19.9 Gy; p=0.03), and Mean heart dose difference between the two plans was 1.6 Gy. Figure 1: Dose statistics in the lungs for 10 patients from IMRT plans (blue) and VMAT plans (orange). Note: IMRT=Intensity Modulated Radiation Therapy; VMAT=Volumetric Modulated Arc Therapy; LV10Gy=Percentage of lung volume receiving 10 Gy; MLD=Mean Lung Dose. Figure 2: The different ways to make spheroids adapted from . The aim of this study was to compare dosimetric differences of VMAT plans to that of a series of IMRT in NSCLC patients. Cancerrelated deaths can be those due to myelosuppression, esophagitis, or severe radiation pneumonitis (RP) [12,13]. Although lung cancer is often assumed to be the cause of death, but treatmentrelated factors could be lethal. Considerable evidence supports the contribution of radiation pneumonitis (RP) to mortality of lung cancer patients. In a retrospective evaluation of 256 patients who underwent radiation therapy for lung cancer, investigators found severe RP was the only factor negatively associated with survival in univariate analyses . In another study of 1225 lung cancer patients received concurrent chemoradiotherapy (CCRT), deaths after treatment were reported to be associated with RP or pulmonary fibrosis . Such investigations have showed significant associations between lung toxicity and OS. The association between radiation therapy to lung and severe RP is well established [16,17]. Theoretically, higher radiotherapy doses could benefit local control in non-small cell lung cancer (NSCLC) patients. In study of RTOG 9311, which enrolled 179 patients with unresectable NSCLC, the dose of radiation therapy was safely escalated to 83.8 Gy for patients with V20<25% and to 77.4 Gy for patients with V20 between 25% and 36% . This study showed that the VMAT plans resulted in significantly better heart sparing than the IMRT plans using the standard five-beam configuration currently used at our institution. Differences in treatment planning between IMRT and VMAT could allow OAR doses and criteria for PTV. The PTV coverage have been equal for IMRT and VMAT. The IMRT and VMAT techniques in itself have different dose distribution characteristics which may result in differences in radiation exposure to the lungs and heart. This was illustrated by a significantly lower HV20Gy, HV30Gy, HV40Gy and mean heart dose (MHD) in the VMAT group, which could be predictive for heart toxicities. The effect of heart dose on patient survival in RTOG 0617 was reported to be associated with early OS in univariate analyses . Investigations of factors influencing OS suggested that the proportion of heart volume receiving radiation dose had a significant negative effect on survival. These results suggest that benefits in OS with dose escalation might be offset by the pulmonary or cardiopulmonary effects of radiotherapy. Advances in radiotherapy planning and radiation delivery techniques such as intensity-modulated radiotherapy (IMRT), volumetric modulated arc therapy (VMAT) may help to minimize the dose to normal tissue sufficiently. These advanced technique benefits of dose escalation . This study demonstrated that the VMAT technique superior plans for heart dose compared with IMRT plans used for lung cancer treatment at our institution. Considering the superior delivery efficiency of VMAT and the fact that the optimized VMAT plan quality in terms of both DVH and conformality of dose distribution well exceeds that of clinical IMRT plans, VMAT may be another preferred modality for treating lung cancer. Govindan R, Page N, Morgensztern D (2006) Changing epidemiology of small-cell lung cancer in the United States over the last 30 years: Analysis of the surveillance, epidemiologic, and end results database. J Clin Oncol 24: 4539-4544. Molina JR, Yang P, Cassivi SD (2008) Non-small cell lung cancer: Epidemiology, risk factors, treatment, and survivorship. Mayo Clin Proc 83: 584-594. Perez CA, Stanley K, Rubin PA (1980) Prospective randomized study of various irradiation doses and fractionation schedules in the treatment of inoperable non-oat-cell carcinoma of the lungs: Preliminary report by the radiation therapy oncology group. Cancer 45: 2744-2753. Bradley JD, Paulus R, Komaki R (2015) Standard-dose versus high dose conformal radiotherapy with concurrent and consolidation carboplatin plus paclitaxel with or without cetuximab for patients with stage IIIA or IIIB non-small-cell lung cancer (RTOG 0617): A randomized, two-by-two factorial phase 3 study. Lancet Oncol 16: 187-199. Rodrigues G, Choy H, Bradley J (2015) Definitive radiotherapy in locally advanced non-small cell lung cancer: Executive summary of an American Society for Radiation Oncology (ASTRO) evidence-based clinical practice guideline. Pract Radiat Oncol 5: 141-148. Grills IS, Yan D, Martinez AA, Vicini FA, Wong JW (2003) Potential for reduced toxicity and dose escalation in the treatment of inoperable non-small cell lung cancer: A comparison of intensity-modulated radiation therapy (IMRT), 3D conformal radiation, and elective nodal irradiation. Int J Radiat Oncol Biol Phys 57: 875-90. Christian JA, Bedford JL, Webb S, Brada M (2007) Comparison of inverse-planned three-dimensional conformal radiotherapy and intensity-modulated radiotherapy for non-small-cell lung cancer. Int J Radiat Oncol Biol Phys 67: 735-741. Bezjak A, Rumble RB, Rodrigues G, Hope A (2012) Intensity-modulated radiotherapy in the treatment of lung cancer. Clin Oncol 24: 508-520. Rancati T, Ceresoli GL, Gagliardi G, Schipani S, Cattaneo GM (2003) Factors predicting radiation pneumonitis in lung cancer patients: A retrospective study. Radiother Oncol 67: 275-283. Wang S, Liao Z, Wei X, Liu HH, Tucker SL (2006) Analysis of clinical and dosimetric factors associated with treatment-related pneumonitis (TRP) in patients with non-small-cell lung cancer (NSCLC) treated with concurrent chemotherapy and three-dimensional conformal radiotherapy (3D-CRT). Int J Radiat Oncol Biol Phys 66: 1399-1407. Bradley JD, Paulus R, Komaki R, Masters G, Blumenschein G (2015) Standard-dose versus high-dose conformal radiotherapy with concurrent and consolidation carboplatin plus paclitaxel with or without cetuximab for patients with stage IIIA or IIIB non-small-cell lung cancer (RTOG 0617): A randomised, two-by-two factorial phase 3 study. Lancet Oncol 16: 187-99. Morota M, Gomi K, Kozuka T, Chin K, Matsuura M (2009) Late toxicity after definitive concurrent chemoradiotherapy for thoracic esophageal carcinoma. Int J Radiat Oncol Biol Phys 75: 122Ã¢ÂÂ128. Rodrigues G, Lock M, DÃ¢ÂÂSouza D, Yu E, Van Dyk J (2004) Prediction of radiation pneumonitis by doseÃ¢ÂÂvolume histogram parameters in lung cancer: A systematic review. Radiother Oncol 71: 127Ã¢ÂÂ138. Inoue A, Kunitoh H, Sekine I, Sumi M, Tokuuye K (2001) Radiation pneumonitis in lung cancer patients: A retrospective study of risk factors and the long-term prognosis. Int J Radiat Oncol Biol Phys 49: 649-655. Minami-Shimmyo Y, Ohe Y, Yamamoto S, Sumi M, Nokihara H (2012) Risk factors for treatment-related death associated with chemotherapy and thoracic radiotherapy for lung cancer. J Thorac Oncol 7: 177-182. Marks LB, Bentzen SM, Deasy JO, Kong FM, Bradley JD (2010) Radiation dose-volume effects in the lung. Int J Radiat Oncol Biol Phys 76: S70Ã¢ÂÂ76. Farr KP, Khalil AA, Knap MM, Moller DS, Grau C (2013) Development of radiation pneumopathy and generalised radiological changes after radiotherapy are independent negative prognostic factors for survival in non-small cell lung cancer patients. Radiother Oncol 107: 382-388. Bradley J, Graham MV, Winter K, Purdy JA, Komaki R (2005) Toxicity and outcome results of RTOG 9311: A phase I-II dose-escalation study using three-dimensional conformal radiotherapy in patients with inoperable non-small cell lung carcinoma. Int J Radiat Oncol Biol Phys 61: 318-328. Liao ZX, Komaki RR, Thames Jr HD, Liu HH, Tucker SL (2010) Influence of technologic advances on outcomes in patients with unresectable, locally advanced non-small-cell lung cancer receiving concomitant chemoradiotherapy. Int J Radiat Oncol Biol Phys 76: 775-781.